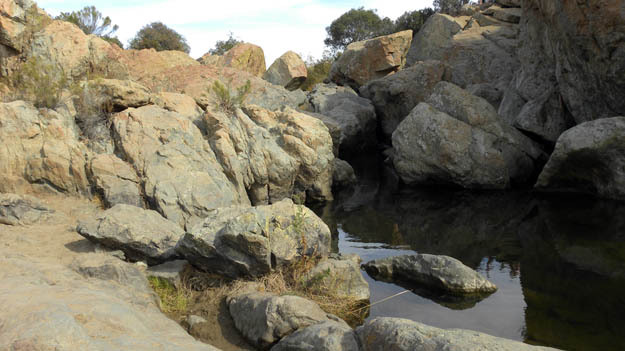 Waterfall (mostly dry) over Jurassic rocks in the Los Peñasquitos Canyon Preserve in San Diego County (N32.92712°, W117.17757°). SAN DIEGO, CALIFORNIA–A nice geological interlude for this Wooster geologist during a family Thanksgiving. This afternoon we visited Los Peñasquitos (meaning little cliffs) Canyon Preserve in San Diego County. We walked about two miles along a trail to an exposure of Jurassic metaconglomerate. The rock is interesting for several reasons. The clasts are either highly angular (meaning parts are a breccia) or very well rounded; the clasts are volcanic in origin; and the matrix includes recrystallized belemnites. The composition suggests that the main sediment source (if not the only one) was a set of offshore volcanic islands. Note the very rounded and very angular clasts in this metaconglomerate. This area has connections to Old California history. Rancho Los Peñasquitos was where General Stephen Watts Kearny and his Army of the West rested after the Battle of San Pasqual in 1846. 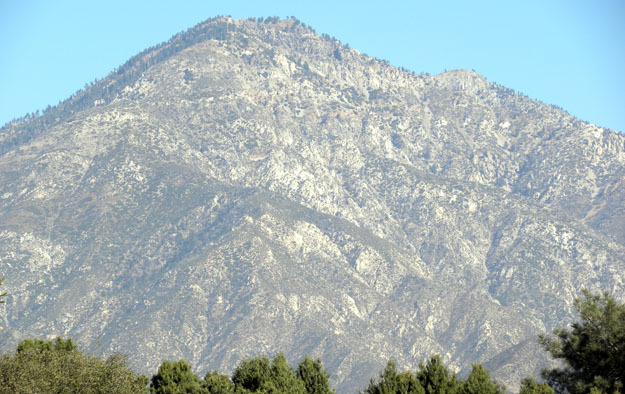 CLAREMONT, CALIFORNIA–The peak above is part of the San Gabriel Mountains just north of Claremont. Today is one of the best southern California offers: brilliant sun, temperatures in the 70s, and very clear skies. Apparently this view of the mountains is not always available because of air pollution, but you would never know it this morning. The San Gabriel Mountains separate the Los Angeles Basin from the Mojave Desert on the other side. The San Andreas Fault runs through them in a very complex way. I’m here for family reasons (Thanksgiving in San Diego — can’t beat that! ), but there is always something geological about! As promised, here’s another digital presentation. The Mineralogy of Mars is presented by Colin Mennett (’10). COLLEGE STATION, TEXAS–I never get tired of that too-obvious joke. I found the above productid brachiopod on the last outcrop of our little Texas expedition. It has been drilled by barnacles, which leave a distinctive slit-shaped hole with a tiny little comma shape at one end. It may not look special here photographed on my backpack in the sunlight, but it is. 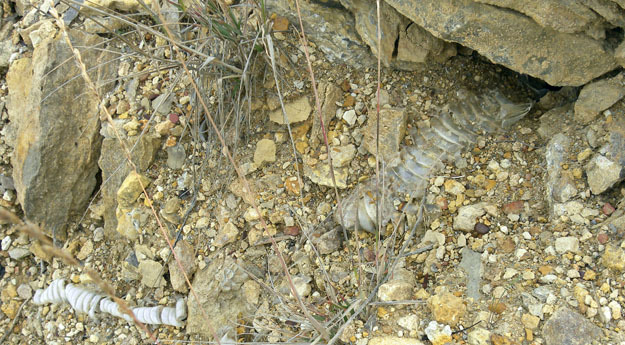 Hard substrate communities in the Permian are still poorly known. This specimen tells us that a future trip may reveal many more such specimens. Paleontologists (and anyone else) should be able to tell me whether these borings were produced during the life of the brachiopod or after its death. Your determination can be posted in the comments below! 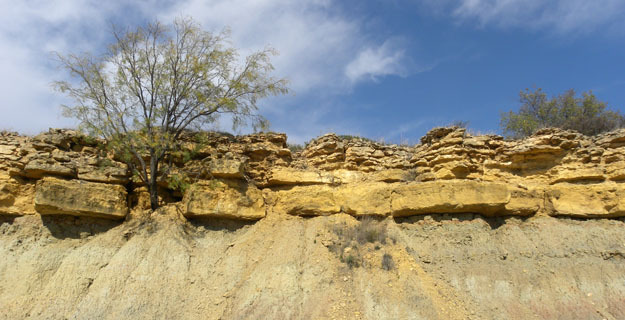 Two West Texas outcrops: which looks more inviting? COLLEGE STATION, TEXAS–The upper one is the base of the Valera Formation on US Highway 84 (N31.88196°, W99.47115°) and the lower one is the lower Bead Mountain Formation on Route 6 near Albany; both are Permian and both have delicious microconchid fossils along with much else. You can imagine which is the more pleasant to work on. Our Permian sections on this Texas trip have had thick beds of gypsum only a meter or three beneath our fossiliferous limestones and shales. 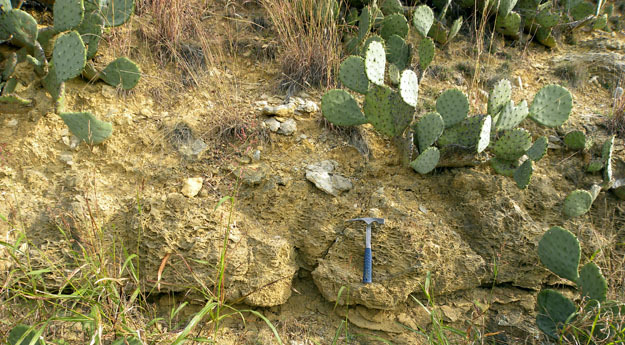 An outcrop of sedimentary gypsum below the Valera Formation (Permian). Gypsum (calcium sulfate) is an evaporite mineral, indicating when the Permian shallow sea in this case was much saltier than normal (hypersaline). Our fossils show a restricted nature (lower diversity than normal, and generally smaller shells), but they were still living in at least close to normal salinities. This is especially the case with our numerous echinoids. We even have evidence of some evaporites within our fossiliferous limestones. It is a curious juxtaposition of depositional environments. The latest issue of the journal Palaeontology has an article describing a new family of large clams from the Triassic of southern Israel. The authors include Allison Mione (’05), who pursued this project as part of her geology Independent Study. 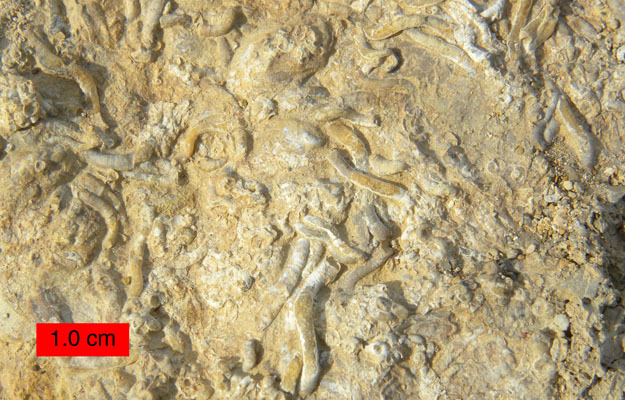 A specimen of the new clam family Ramonalinidae from the Triassic of southern Israel in Makhtesh Ramon. 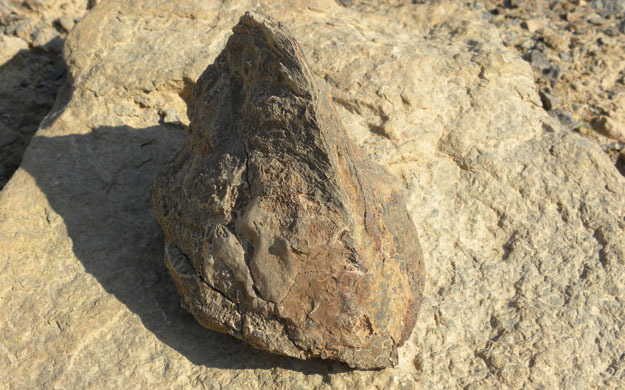 Abstract: Ramonalina n. gen. is a large thick-shelled bivalve abundant in mounds preserved in the Gevanim Formation (late Anisian, Middle Triassic) of southern Israel. 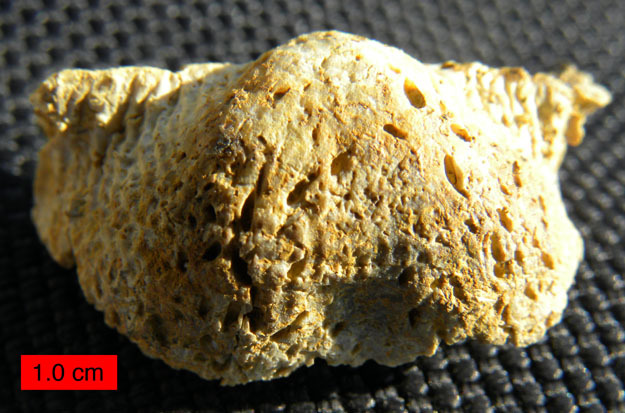 This bivalve was an edgewise-recliner with a flattened anteroventral (functionally basal) surface and partially fused valves. It is the basis of a new family, the Ramonalinidae, which is descended from the myalinids through adaptation to edgewise positioning. Ligamental attachment was inadequate to hold valves together on large adults, resulting in valve displacement followed by shell secretion in the apical area that fused valves together and caused irregular growth on abapical areas. The ramonalinids formed large, nearly monospecific mounds on firm mud substrates in shallow marine waters. 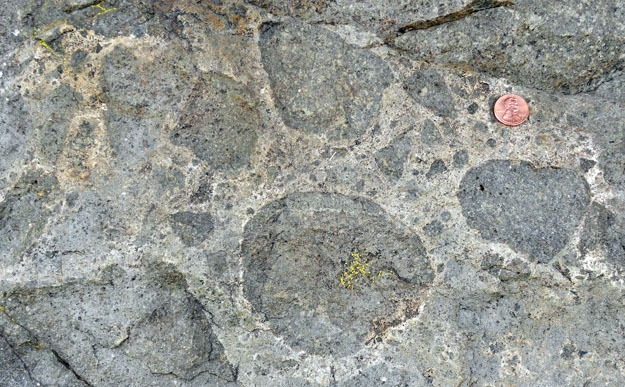 These are the largest Middle Triassic bivalve mounds known. Molted skin layer from a rattlesnake apparently in the cavity underneath the nice piece of Permian limestone. I didn't poke around in there to wake him up, and I let that limestone stay where it was. BROWNWOOD, TEXAS–It was nearly a five hour drive from College Station, Texas, through the Hill Country to our first Permian exposure in West Texas. (We passed, by the way, through Killeen and Fort Hood.) It was worth the trip for all the strange features we found on this outcrop of the Valera Formation. 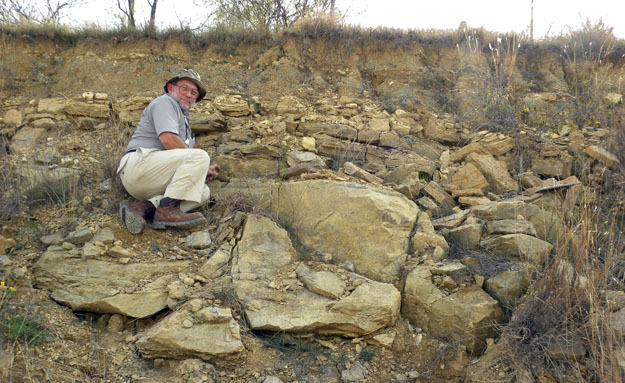 Tom Yancey, a paleontologist at Texas A&M University, seated on our little outcrop of the Valera Formation in West Texas (N31.48454°, W99.69368°). We spent several hours measuring, describing and sampling this outcrop in ideal weather. We found plenty of examples of what we came here for: fossil microconchids, otherwise known as “worm tubes”. Microconchid tubes from the Valera Formation at the above outcrop. 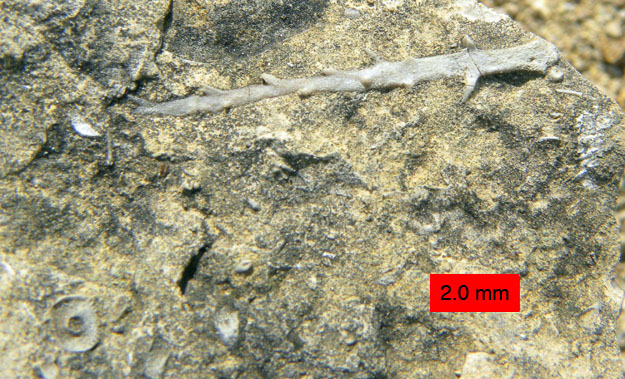 A barbed echinoid spine from the Valera Formation (Permian). In the lower left with the apparent hole in it is an echinoid test plate. Tomorrow we visit a similar outcrop with microconchids. Now we have some hypotheses to test. Fieldwork is such a joy! 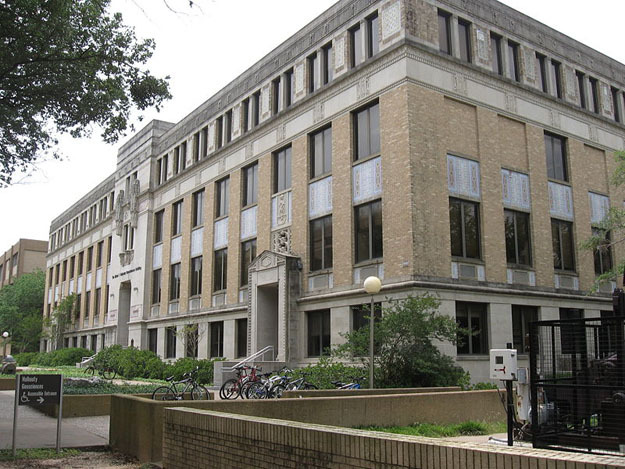 COLLEGE STATION, TEXAS–I arrived this afternoon in beautiful central Texas to give a talk at Texas A&M University on bioerosion. If you click the link you can see my PowerPoint slides. The talk went well enough and there were many questions. It is a fun topic because it is at an intersection of geology and biology. Tomorrow Tom Yancey and I drive to Brownwood, Texas, to begin a field project in the Permian. There are some very curious “worm tube” clusters that I hope to post photos of soon. I’m excited to be able to work in the Permian, which I haven’t done since my dissertation days. The weather is absolutely perfect here!